If you are a runner, you probably like to run. If your get injured, you probably still want to run. You need a doctor who will be on your team, not the other way around. Times in medicine have changed. Arguably they have changed for the better. It used to be that there was this very paternalistic attitude among doctors. Whenever the patient would seek treatment, the doctor would simply tell the patient what to do. The patient was expected to do as he was told. But in the last few decades the power has clearly shifted back toward the patient. Patients expect good customer service, expert advice and expect to get better. The advent of the internet has done more than any other single factor to shift the power of healing back toward the patient. If you have a running injury, the chances are good that you can find the information online that will help you determine what structure is injured, and what it will take to heal that running injury. Not surprisingly, many runners already have a fairly clear idea of what is going on with a running injury when they show up at the doctor’s office. Some doctors find this troubling. Some physicians even take offense at the notion that the patient could have made a self-diagnosis. But regardless of the doctor’s attitude, the patient has the ability and information available to get a pretty good idea of what may be causing foot pain whenever a running injury crops up. My suspicion is that the overwhelming majority of injured runners are able to heal their injuries on their own. Whether advice comes from running buddies or Dr. Google, common running injuries can be fairly easy to self-treat. But when attempted self-treatments fail, frustrated runners will find himself seeking help from a sports medicine physician. Once you suffer the obligatory stay in the waiting room be prepared to ask yourself whether or not your doctor offers up any of the following reasons for you to lose faith. 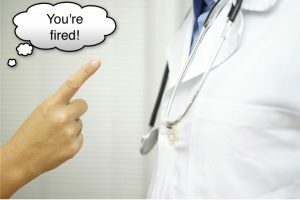 Here are the top five reasons runners should fire their doctor. 1. Your doctor lacks experience treating runners. There’s a long running joke that says doctors are “practicing medicine” because they’re still trying to figure out how to do it. No one wants a doctor who looks like Doogie Howser, M.D. The base assumption is that a young doctor has much less experience than an older one. But grey hairs and years in practice are simply not enough for a runner. You need running specific expertise. The unfortunately reality is that some doctors like treating runners and some doctors hate it. The simplest way to figure out whether or not your doctor really has experience healing running injuries is to ask. 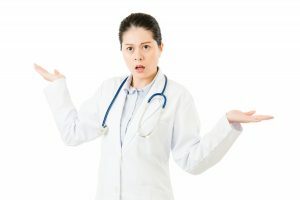 Of course, most patients won’t be comfortable looking the doctor in the eye and asking her whether or not she is truly qualified to help with a running injury. But you can do a little clandestine research before you meet the doctor to help figure out whether or not running injuries are a subspecialty of your chosen physician. If you look up the doctors practice website and find many articles written about common running injuries you’re probably heading down the right path. However, if instead you find many general articles about feet and ways to stay healthy and active, your doctor may be more of a general orthopedist than a running specific physician. Most of the doctors I personally know whom specialize in running injuries either currently run frequently or they used to run competitively. Most of those doctors also have pictures of themselves running marathons somewhere on their website. Even if your doctor seems to be an excellent physician based on her credentials and training, you may be better off seeking a physician who enjoys working with runners and has a great deal of experience treating running injuries. 2. The other patients don’t look like runners. The next time you go to the doctor, look around the waiting room. Does the crowd there look like the group you see whenever you register for a marathon? Or, does it look like registration for Wednesday night bingo at the nursing home? If you see a sports medicine physician who really spends most of his time working with athletes, his waiting room should be filled with athletes. But if instead of truly working with athletes he simply has a practice that promotes the idea of being active, he may have a waiting room filled with elderly, obese sedentary appearing patients. If you look around the waiting room and it appears most of the patients couldn’t even run from the couch to the refrigerator, it’s hard understand how the doctor could get much experience working with injured runners. 3. Your doctor thinks running and other forms of exercise are the same. Have you ever heard, “Running is too hard on the body, you should swim instead.” Running can place larger forces on the body then walking. It is simply math and physics. More force equals more stress. Many doctors will attempt to coerce patients into switching forms of exercise. I will openly acknowledge that this strategy makes sense for people who are simply exercising to lose weight or maintain a certain fitness level. Switching from running to riding a bike, swimming or working out on an elliptical trainer can decrease the stresses and mitigate the strain applied to a variety of structures in the feet and ankles. In theory, lower stress, lower impact exercising can help running injuries heal faster. But any runner can quickly explain there is no sufficient substitute for running. I myself and an Ironman triathlete. I’ve finished 15 Ironman races. I have ridden my bicycle for thousands of miles. I’ve also spent a lot of time swimming. But I am a runner at heart. I don’t think I would die if I had to stop swimming. And frankly I could get up riding my bike. I don’t think I could give up running. Running is the most efficient form of exercise I have ever found. One hour of running can give me a work out that would take about five hours to achieve on the bike. I could swim all day and not get the same level of exercise that I do when I run for an hour. But more than that, running does something unique in terms of reduction of stress. I’ve tried many different forms of exercise. I love rock climbing. I like to ski. But nothing comes close to running. It frankly still baffles me a little bit that physicians so quickly ask patients to switch from running to biking, swimming or weight training. But regardless of my confusion, I am clear that any doctor who thinks running has many different equivalent exercise options or substitutions cannot really understand all of the nuances of running or the injured runner. 4. Your doctor doesn’t run. Let’s imagine for a moment that you let yourself go. Maybe you lapsed into a work coma. Years of work stress and over-eating have resulted in a doubling of your waist size. You make a New Year’s resolution to get your weight under control. You schedule a consultation with a nutritionist who will help you determine how to make the biggest shifts in your diet to start to lose weight immediately. As you sit on the crinkly paper on top of the medical exam chair, you wait. With a light knock on the door, the treatment room door swings open to reveal a smiling rotund man in a white coat. The nutritionist weighs 400 pounds of the weighs an ounce. Although he seems knowledgeable and friendly you simply cannot push out of your mind the realization that there is mustard on the lapel of his white coat. Would you take dietary advice from a fat guy with condiments on his coat? I wouldn’t take accounting advice from a bookkeeper who is broke. I wouldn’t take dietary advice from anyone who is overweight. Because even if they are experts they just don’t really seem to get the practical application of the best advice…even if it is their own. Do you have any friends for family members who don’t really seem to get why you run? You know, the ones who think it’s a little obsessive to run in the dark before work. The one who tell you to “take it easy” instead of running on the weekends? Although our less-active loved ones mean well, they just don’t understand why running is so important to us. If your closest friends and family can’t understand why you are running, do you really think a total stranger like a doctor will understand you better? If your doctor doesn’t run, you can’t expect her to understand your passion for running. Nor should you expect her to support it. It’s just much easier to relate to a doctor who runs and understands runners. If your doctor’s very best idea is that you should give up running, time to go to Plan B. Find a doctor who will help you keep running! I am often invited to lecture at medical conferences to teach physicians about running injuries. Virtually every time I give a lecture and present a case of an injured runner with a complicated problem, I try to make the talks interactive and so I will ask the audience what treatment they would recommend. Keep in mind, the attendees are all doctors. The goal of any physician treating a patient with a running injury is to help the patient figure out how to run. Of course, the simple, easy way is instead to tell you to stop running. After all, if you can walk without pain and it only hurts when you run, if you stop running the “problem” is solved. To you as a runner, the problem is not pain. The problem is that you have pain when you run. You have to expect, and sometimes demand the doctor help you figure out how to run. It is crucial that you explain to your doctor that running is not a hobby, it’s not a way for you to lose weight, and it’s not a way for you to pass the time. When you have a running injury, running isn’t the problem, running is the goal! Make it clear to your physician that running is a part of your life. Running is a lifestyle not an activity. You are hiring a physician to give expert advice and guidance and help you develop strategies to continue running. 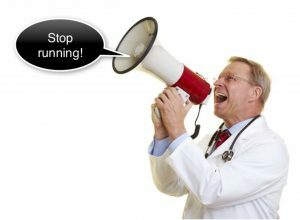 So if your doctor says, “stop running”…fire your doctor. Then go find a doctor who will help you figure out how to keep running.